Phra Ratsamee started Buddhangkura Buddhist Temple in Olympia 18 years ago. Prior to that, he was assistant abbot at an Australian temple for four years, then went to California and North Carolina. Phra Ratsamee was born in Surin Province in Thailand in 1962, and was ordained there in 1988 by Luong Phu Dilok. He stayed at the branches for five years. His reason to ordain, he says, was to pay back the goodness of his parents, and to learn how to be free from suffering. Phra Ratsamee’s specialty is training novices, but he does much more than that. He is always busy. He leads all the traditional Thai ceremonies, sprinkling them heavily with the dhamma. 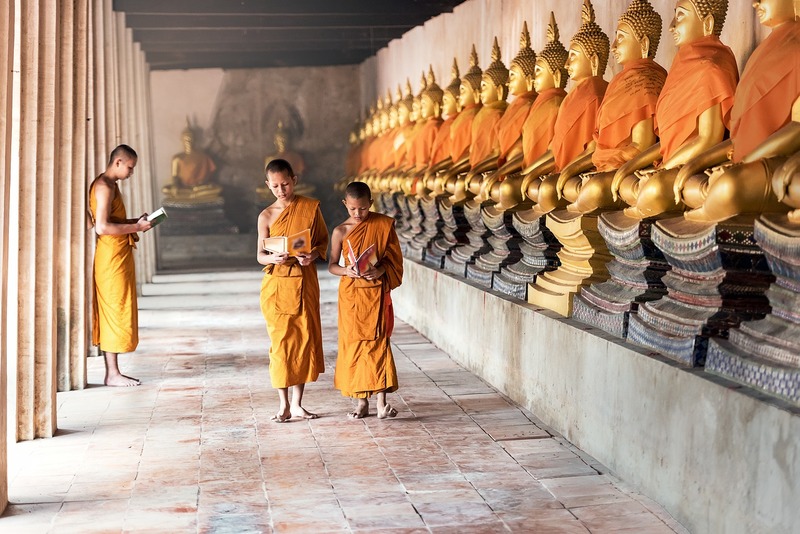 He trains the resident monks in chanting, conveys the vinaya, oversees work around the monastery, and has taken on large projects here and in Thailand. One of them is never-ending: the construction at his home village in Thailand of the Big Buddha, along with supporting buildings such as overnight facilities for monks traveling to the site. See the Big Buddha tab for more information. Born in 1980 in Chaiyaphum province in NE Thailand, Venerable Phumijitto was given that name at ordination in 2002, meaning unshakeable/strong mind. He uses the nickname Venerable Lord. As a novice at Kanjanaburi Temple, he met Phra Ratsamee who was also staying there, and who contacted him in 2008 to join the monastery in Olympia. Venerable Phumijitto had trained in the Missionary Abroad program for 3 months. He came straight here, and has been here ever since. Phra Phumijitto likes Buddhangkura Temple because of the extensive grounds and the trees. He has only been back home three times in all this time, able to live away from home for a long period, thus living up to his name, strong mind. He is the go-to monk for assistance with audio-visual equipment, and is the monastery’s secretary. Note: Some of the Thai monks spend winter in Thailand, so call ahead if you wish to see a particular monk during that time. “Gain/loss, status/disgrace, censure/praise, pleasure/pain: these conditions among human beings are inconstant, impermanent, subject to change. Knowing this, the wise person, mindful, ponders these changing conditions. Desirable things don’t charm the mind, undesirable ones bring no resistance. His welcoming and rebelling are scattered, gone to their end, do not exist.